renewable diesel in 2016, outpacing the previous record by almost 40 percent. Also for the first time ever, the monthly market topped 300 million gallons, with December’s numbers coming in at 362 million gallons. “We are proud to be delivering record gallons of American made biodiesel, but that success is undermined by the fact our members are losing more than a third of the market to foreign imports,” said National Biodiesel Board CEO, Donnell Rehagen. According to numbers released by the EPA Thursday, the 2.9 billion gallons was an increase of 800 milliongallons from 2.1 billion gallons of biodiesel and renewable diesel in 2015. At the same time domestic production rose from about 1.4 billion gallons in 2015 to more than 1.8 billion gallons in 2016, well below available capacity. Imports increased by more than 50 percent from an estimated 670 million gallons in 2015 to over 1 billion gallons in 2016, shortchanging potential economic benefits to U.S. producers. “The market realities spotlight two important points. First the RFS is working to deliver energy choices to consumers and promote local economic activity. Second that reforming the biodiesel tax incentive as a domestic production credit remains critical to grow these programs in America’s best interest,” Rehagen said. 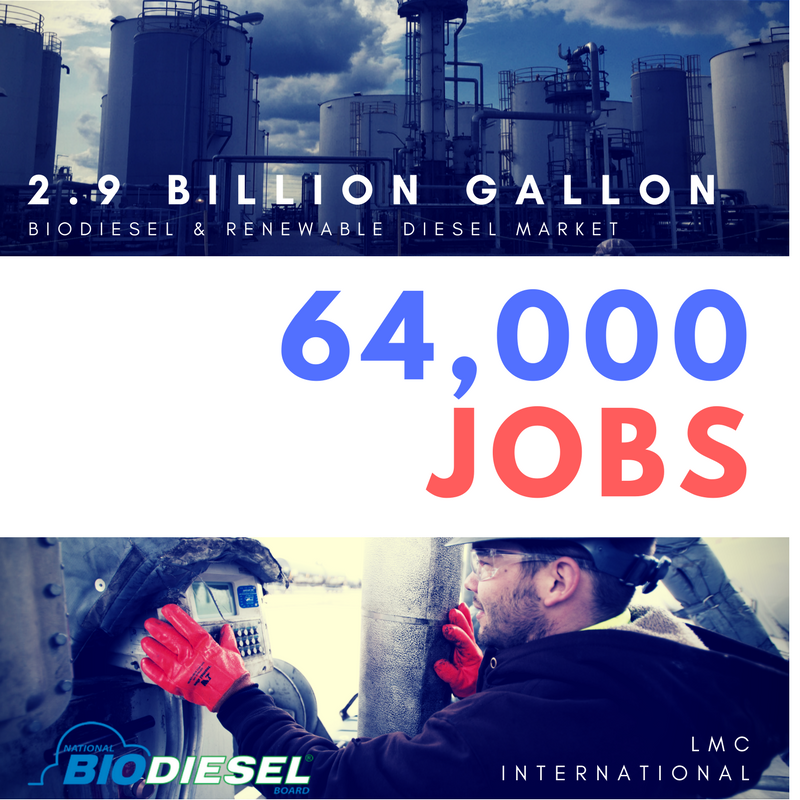 According to a study conducted by LMC International, a 2.9 billion gallon biodiesel and renewable diesel market divided between domestic and foreign supply supports about 64,000 U.S. jobs and $11.42 billion in total impact. Economic benefits increase substantially with growing domestic production, rather than imports. For example, just 2.5 billion gallons domestic production would support at least 81,600 U.S. jobs and $14.7 billion in total economic benefit. “It’s just common sense that our tax dollars should benefit American jobs and local companies instead of incentivizing imports,” Rehagen said. The biomass-based diesel category under the RFS alone saw a record 2.6 billion gallon market, allowing the advanced biofuel program to reach over 4 billion ethanol-equivalent gallons. These numbers exceeded EPA’s estimates for 2016, and track NBB’s projections, showing the industry can deliver on the goals set by Congress. EPA’s announcement comes on the heels of the biodiesel industry’s premier event, the National Biodiesel Conference & Expo, held last week in San Diego. During the event biodiesel experts from around the nation discussed future opportunities to grow America’s Advanced Biofuel. NBB is the U.S. trade association representing the entire biodiesel value chain, including producers, feedstock suppliers, and fuel distributors, as well as the U.S. renewable diesel industry.